Calcareous marshes and springy places. Fens. Can be found growing in flowing water. Mimulus glabratus var. fremontii, Lythrum alatum, Pedicularis laceolata, Solidago ohioensis, Lysimachia quadriflora, Lobelia kalmii, Juncus brachycephalus, Eupatorium maculatum, Eupatorium perfoliatum. NY and southern Ontario west to MN and British Columbia, south to FL and Mexico. Also occurs in Europe and the Mediterranean. Aquatic perennial. Leaves oblong, pinnate compound; leaflets 9-23, lanceolate to oblong or ovate, serrate or lobed, commonly lanceolate and deeply incised on upper leaves. Flowers in umbellets to 1 cm wide; flowers white. 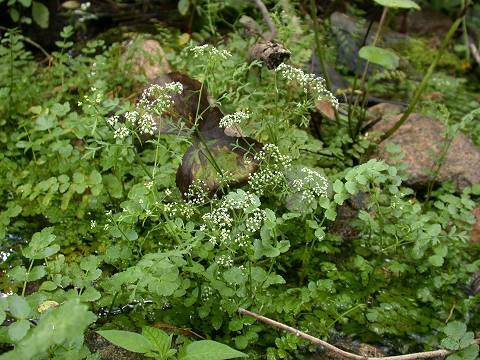 Can be found in the same habitats as watercress (Nasturtium officinale). Also occurs in Europe.